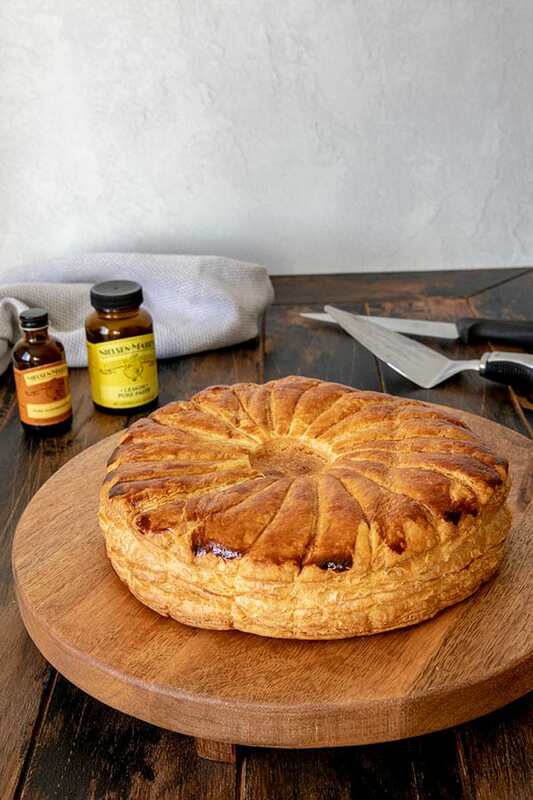 A Pithivier is a luscious puff pastry pie with a creamy almond filling. 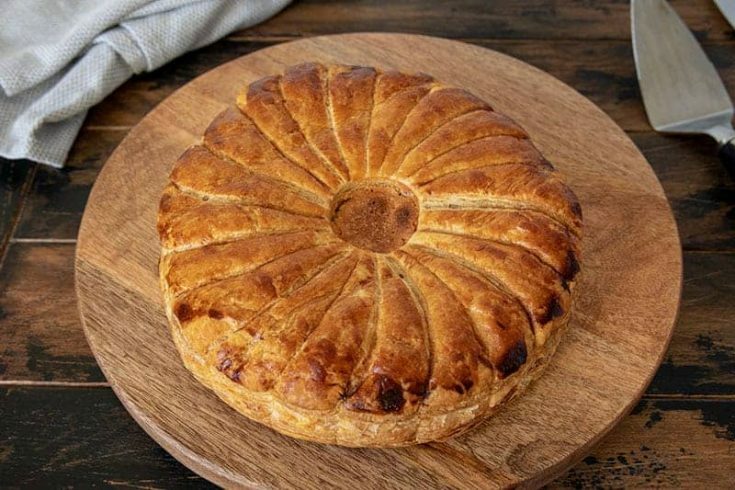 It’s also know as a Galette De Rois or a King Cake. No matter what you called it, it’s irresistibly delicious, and you’ll be surprised just how easy it is to make. 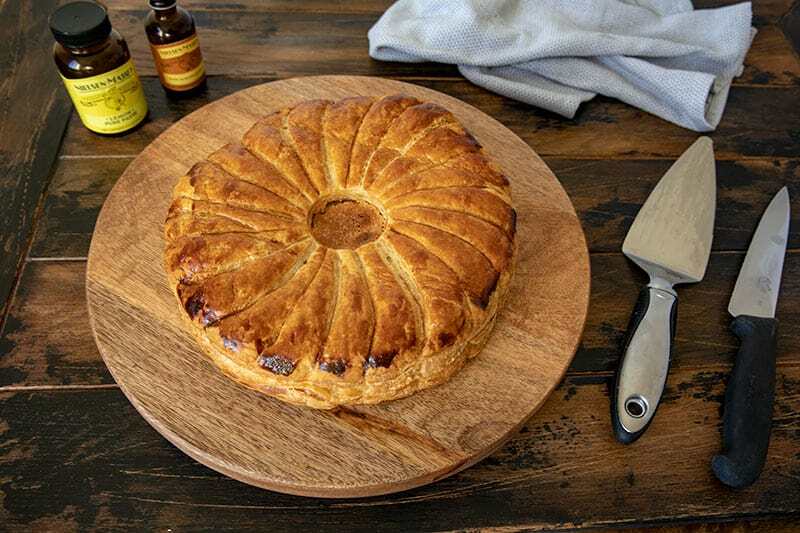 I have teamed up with Nielsen-Massey, a company who makes the world’s finest premium vanilla and flavor products, to bring you this pithivier recipe. My family loves it when I’m baking. The smell of fresh baked goods magically draws them into the kitchen, and I’m always happy to have company in the kitchen. One of my favorite kitchen helpers is my seven-year-old grandson. He loves baking with grandma. Usually we bake something quick and easy like cookies, but I know he would proud to help me bake something as spectacular as this Pithivier. While it looks difficult, it’s actually easy to make. The Pithivier is a spectacular looking dessert, and it tastes as good as it looks! But don’t be intimidated to make this gorgeous dessert. I’ve simplified the recipe so it’s easy to make, and I have made a template to help you decorate the top. Your friends and family are going to be so impressed with your baking skills! While it might seem like a lot of steps, they’re all easy, and this dessert comes together quickly. The first thing you need to make a Pithivier is puff pastry. You can buy good frozen puff pastry in the frozen food section of most grocery stores. However, if you want you can make puff pastry from scratch, visit my kouign amann post for great step-by-step photos and a puff pastry/laminated dough recipe. Before you use the puff pastry dough, you need to thaw it. You can thaw the puff pastry on the counter for 40 minutes, but I prefer to thaw it in the refrigerator overnight. When you thaw it in the refrigerator, it’s less likely to crack when you unfold it. There are two puff pastry sheets in a package. You’ll use both of them to make two rounds—one for the bottom and one for the top of the pastry. The pastry is usually 9-inches wide, so you shouldn’t need to roll it out, other than to smooth the top if necessary. 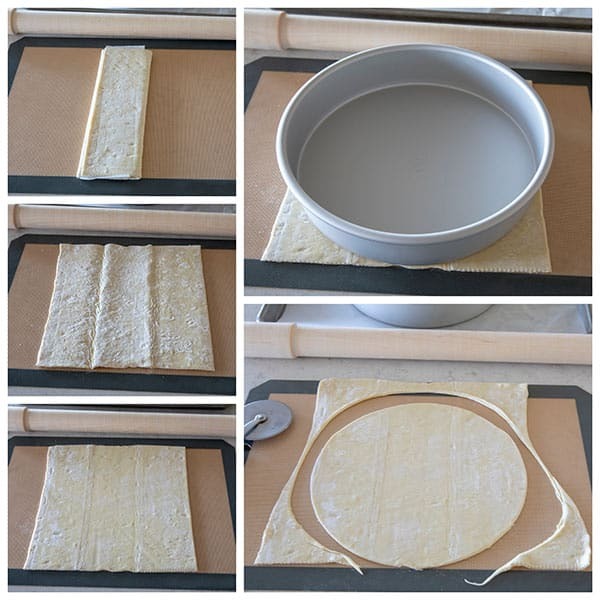 Use a 9-inch round cake pan as a template to cut the top and bottom pastry rounds. Once you have the top and bottom cut, put them in the refrigerator to chill while you make the almond cream filling. You want to keep your puff pastry well chilled in order to maintain the flaky layers in the baked product (the chilled butter between the layers of dough explode in the oven; if the butter melts, there’s no explosion and no flaky layers). The first time I had a pithivier was at a local bakery, and it was love at first bite. The pastry is light and flaky, and the filling is rich and creamy. The pastry chef told me she added lemon to the filling to add a little brightness. So when I was creating the filling for my pithivier recipe, I followed her lead and used Nielsen-Massey’s Pure Almond Extract as well as their Pure Lemon Paste. 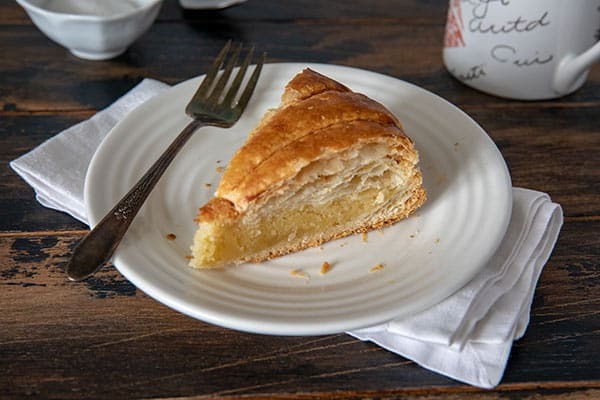 Almond cream, frangipane, is a traditional French filling used for celebrations. My almond cream filling is made from scratch with the finest ingredients: finely ground almond flour, butter, sugar, eggs, and Nielsen-Massey’s Pure Almond Extract and Pure Lemon Paste. Nielsen-Massey’s Pure Almond Extract is made with the purest oil of bitter almond to deliver optimal results in flavor and quality. It’s a key component to the almond cream. In addition to Nielsen-Massey’s Pure Almond Extract. 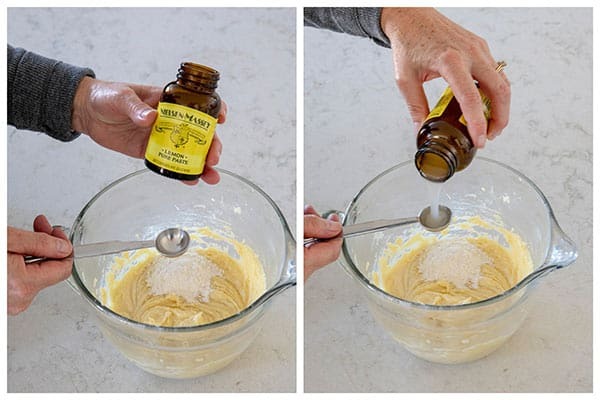 I also added Nielsen-Massey’s Pure Lemon Paste made with Nielsen-Massey’s Pure Lemon Extract. The paste’s thick consistency (similar to molasses) let’s you add a wonderful lemon flavor without the need to juice or zest lemons. Nielsen-Massey uses premium ingredients from around the world to make their vanillas and flavors to ensure they meet Nielsen-Massey’s high quality standards. Pure Lemon Paste contains oil drawn from the natural essence of the highest quality California lemons. I love the bright fresh flavor the Pure Lemon Paste gives my baked goods. Now that you have your two puff pastry rounds and your almond cream filling made, it’s time to create the design on the top pastry round. I am not very good at cutting evenly spaced lines. So instead of free hand cutting the lines, I created a template that I printed on my home printer on 8.5 x 11-inch paper. All you need to do is print the template and use a ball point pen to trace the lines onto your pastry round. Then take a sharp knife and lightly score the top of the pastry. Don’t cut it all the way through, since you’re just creating a pretty design on top. I used a piping tip to cut a hole in the middle of the top pastry round to allow steam to escape while baking. Once you have your design cut in the top round, it’s time to assemble the pastry. Place the bottom round on a sheet of parchment or Siplat on a baking tray. Brush a 1-inch border on the bottom round with egg wash, being careful not to drip egg wash down the sides. Add the filling to the center of the bottom pastry round. Spread the filling, keeping it 1 inch from the edges. Next, center the decorated top pastry round on top of the filling. Press the edges of the puff pastry together to seal in the filling. Then use the back of a small paring knife to create a pretty scalloped edge as shown above. Finally, when the pastry is assembled, you want to brush the remaining egg wash over the entire top of the pastry. Be careful not to let the egg wash drip down the sides of the pastry, which could prevent the puff pastry from rising on the edges. Once assembled, just pop it in the oven. It’s fun to watch it while it’s baking. My grandson loves watching puff pastry as it rises in the oven! You’re going to bake if for 45 to 50 minutes. You may be tempted to remove it from the oven sooner if it’s puffed up and browned. DON’T DO IT! If you take if out of the oven too soon, it will deflate as it rests on the counter. You want to give all those layers time to crisp up. It’s going to smell amazing in your kitchen while this is baking, and you’ll be tempted to cut it and serve it as soon as it’s out of the oven. But, for the best results, you should wait until it’s completely cool – about an hour. This is a perfect holiday pastry. You can serve it any time of day. It’s great with a cup of coffee in the morning, or the perfect end to a holiday meal. The bakery where I tasted my first pithivier serves this pastry year-round. So, don’t feel like you have to make it only on special occasions. This gorgeous pastry will make any day special! 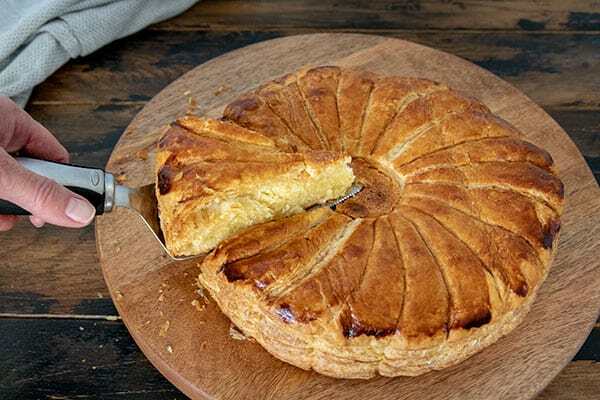 A Pithivier is a luscious puff pastry pie with a creamy almond filling. You'll be surprised just how easy my version is to make. Line a baking sheet with parchment or a Silpat. 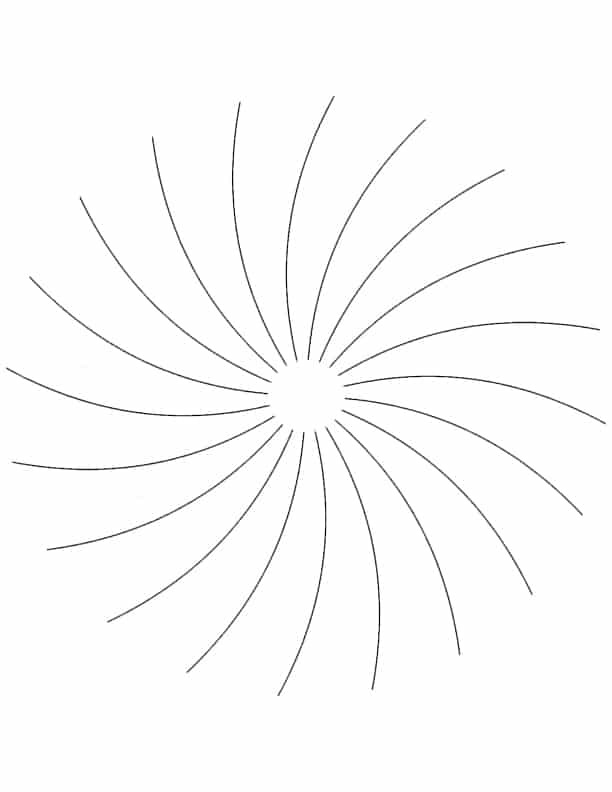 Unfold pastry sheet on a lightly floured surface or Silpat. If pastry cracks when unfolding, sprinkle the crack with water and press the edges together to seal. If necessary, use a rolling pin to roll the pastry sheet to 9 inches wide. 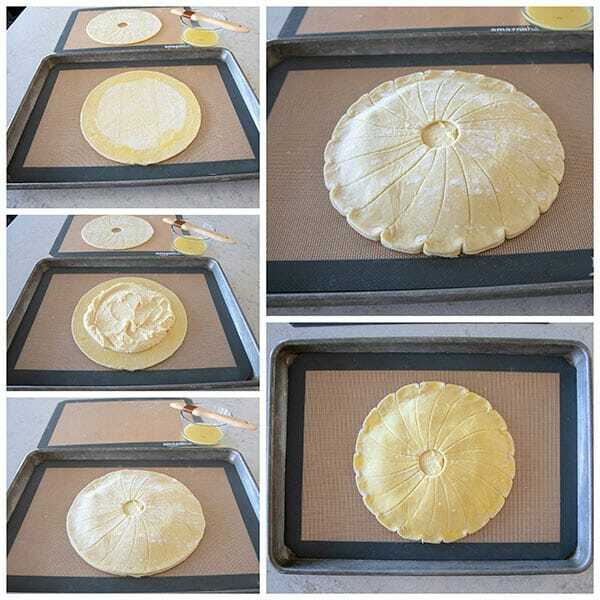 Cut pastry sheets into two 9-inch circles. (Use a round 9-inch cake pan as a guide.) Place one puff pastry round on the parchment lined baking sheet and place a sheet of parchment on top. Place the second pastry round on top of the parchment. Put the baking sheet in the refrigerator while you make the frangipane. Make the frangipane: In a mixing bowl, cream together the butter and sugar on medium speed until light and fluffy, about 3 minutes. Add the almond flour and beat on medium speed until thoroughly blended, about 1 minute. Add the egg and mix on low speed until blended. 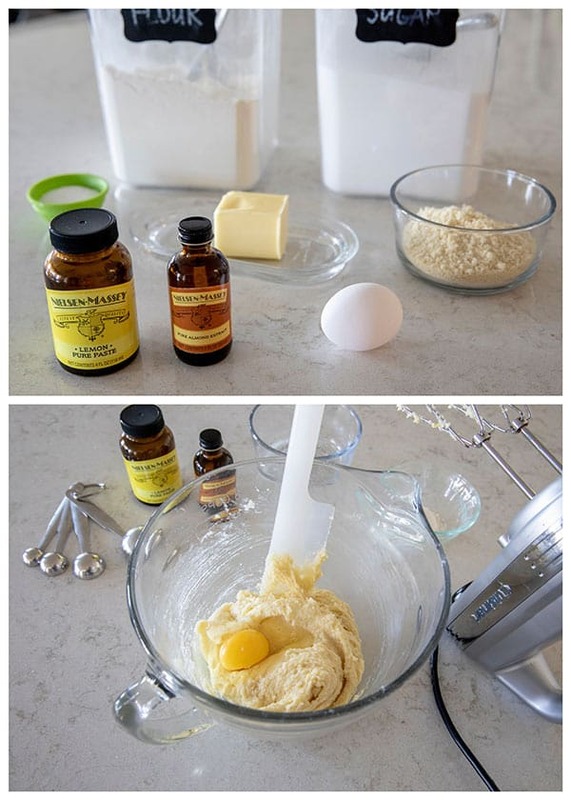 Add the all-purpose flour, lemon paste, almond extract, and salt, and beat just until combined. Refrigerate until ready to use. Creating the decorated top: Using a small paring knife, starting from the center of the hole, score a sun-ray decorative pattern on the top of round. You only want to cut through the top layers of the pastry. 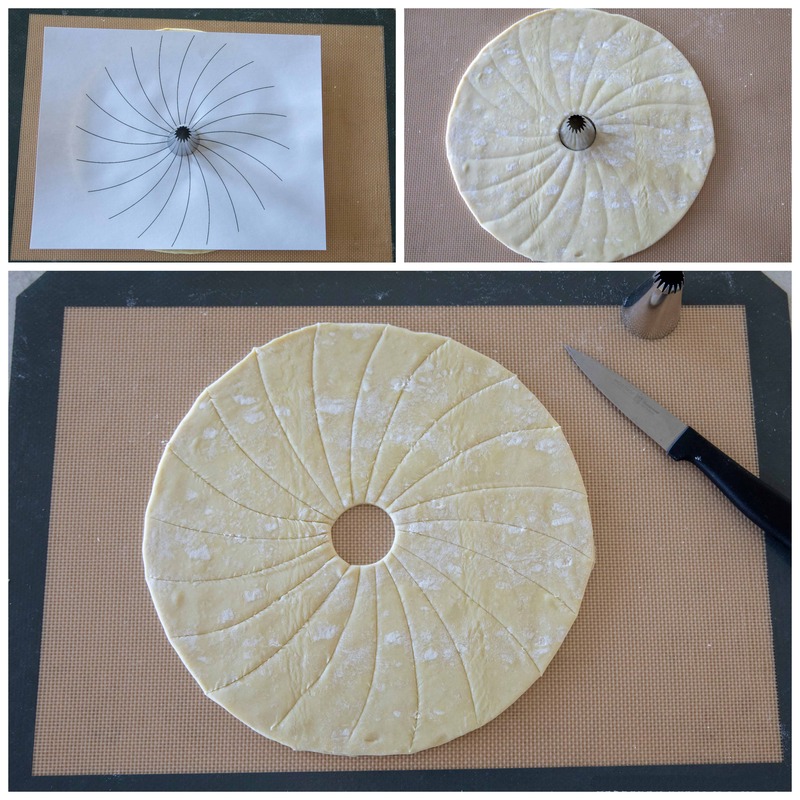 Don’t cut it all the way through the pastry (I’ve created a template to make this easy). Return pastry to the refrigerator while oven preheats. Remove both pastry rounds from the refrigerator. Place the bottom round on parchment paper or Silpat in the center of the baking tray. In a small bowl, whisk together the egg yolk and the heavy cream to create an egg wash. Brush a 1-inch border on the bottom round with the egg wash. Be careful not to let the egg wash drip down the sides, which could interfere with the puff pastry rising during baking. Place the frangipane in the center of the bottom round. Carefully center the top round on top of the frangipane. Use your fingers to gently seal the edges of the top round to the bottom round. With the back of a knife, score the outer edge of the pastry at regular intervals to create a scalloped edge. Using a pastry brush, brush the entire top of the pastry with the remaining egg wash. Be careful not to let the egg wash drip down the sides, which could interfere with the puff pastry rising during baking. Bake until puffed and golden brown, about 45 to 50 minutes. Transfer Pithivier to a wire rack, and let cool at least at least 1 hour before serving. Pithiviers are best served the day they are baked. However you can keep it in an airtight container on the counter for up to 2 days. To refresh it, bake it at 300°F (140°C) for 5 to 8 minutes before serving. *Thaw puff pastry sheets overnight in the refrigerator, or at room temperature for 40 minutes or until easy to handle. Refrigerate leftover scraps of puff pastry. Later top the scraps with some melted butter and cinnamon sugar and bake until puffed and golden brown. Disclosure: This post is sponsored by Nielsen-Massey, but all opinions expressed are always my own. You can also find Nielsen-Massey on Facebook, Twitter, Instagram, and Pinterest. Thank you! I’m going to serve this alongside the traditional pumpkin pie for Thanksgiving. I’ll try making my own lemon paste, just to see how that goes. If that’s a flop, I’ll purchase some through your link. I smile each time an email from you arrives, and my smile upon seeing this recipe was even broader. Thank so much Jeri – your comment put a big smile on my face. It will be the perfect addition to your Thanksgiving dessert. I’m so intrigued by this gorgeous dessert and want to tackle baking it with my daughter – thank you!! Thanks Liren – have fun baking with your daughter! What a lovely pastry cake! I think it’s adorable your grandson loves to bake with grandma. My grandchildren love baking cookies with me as well! So precious! Have a wonderful week! I have always wanted to try a king cake! This is absolutely gorgeous. Thanks Dorothy – definitely give it a try. This is just SO pretty! I wish I had a slice right now! Thanks Taylor – wish I could send you one. Such a gorgeous recipe! 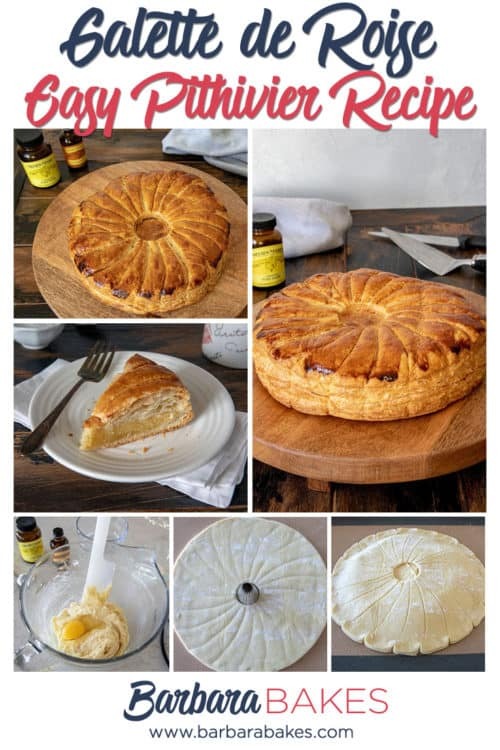 I’m fascinated with the background (this was a first introduction to Pithivier for me) and your step-by-step instruction makes it so easy. Thanks Toni – it really is easy to make. Thank you so much for sharing this. I absolutely love anything made with a light and flaky pastry crust. What a nifty idea to use the template. LOve the tips that you share. Thanks Genene! The template really did make decorating the top so easy. Happy holidays! What a lovely tutorial, and thank you for the template that you made. You had me at “almond”. This is a stunning dessert, and you made it look very doable. It’s definitely very doable. I hope you’ll give it a try Deb. This is beautiful! Great work and love the history of this…might be a Thanksgiving break treat for the family. Thanks! It was fun researching the history. Thanks so much Carol! You definitely can do it.